Kerala High Court Notification is out. Kerala High Court is recruiting for 21 Research Assistant Govt Job Posts. You can check Kerala High Court - Kerala High Court last date, download Kerala High Court notification, visit Kerala High Court official website and check other Kerala High Court Vacancy details.Complete Vacancy and recruitment Details about 21 Research Assistant Govt Job vacancies in Kerala High Court are provided below by JobSarkari.Com only for you. Last Date for Step I and Step - II Regsitration 25/02/2019. Research Assistant Candidate Must Have Passed Graduation in Law. Final Year/Semester Law Students Are Also Eligible to Apply. 21. Candidates born Between 26.02.1991 and 25.02.1997 (both days inclusive) are eligible to apply. 1. On the Basis of Viva Voce Examination. 6. Online Application Can be Submitted on or Before 25th February 2019. Q. 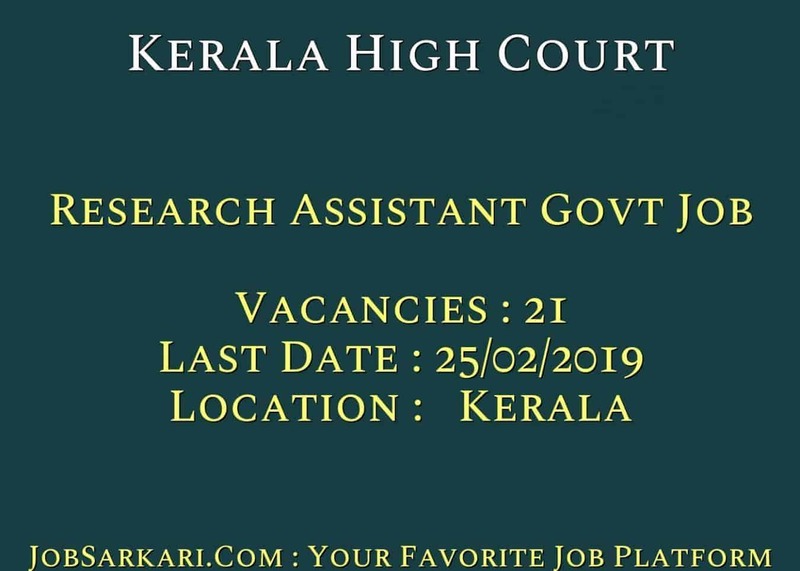 What is the Last Date For Kerala High Court Research Assistant Govt Job Vacancy ? A. 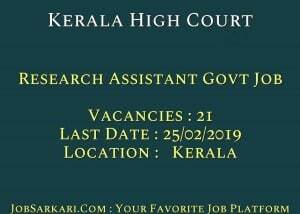 Last Date for Kerala High Court Research Assistant Govt Job Posts is 25/02/2019. Q. What is the Form Type of Kerala High Court Research Assistant Govt Job Recruitment ? A. The Form Type for Kerala High Court Research Assistant Govt Job Posts is Online. Q. How many vacancies are available in Kerala High Court Research Assistant Govt Job Posts ? A. There are about 21 Vacancies in Kerala High Court Research Assistant Govt Job Posts. Q. What is the Full Form of Kerala High Court ? A. Full Form of Kerala High Court is Kerala High Court .